My daughter loves babies. She loves to cuddle them, carry them, play with them, kiss them and otherwise smother them with attention. I remember being the that child too. The girl who my mum would introduce to friends with babies as ‘M, she loves babies’. I remember cuddling my baby cousins for hours, following my aunt upstairs as she went to feed them and helping at bath time. I would vie for the attention of the smallest guests at the various parties and gatherings we were dragged to as kids – taking turns with other children who loved babies. I was never scared of handling babies and I’m sure that helped me when I had my own little people to look after. 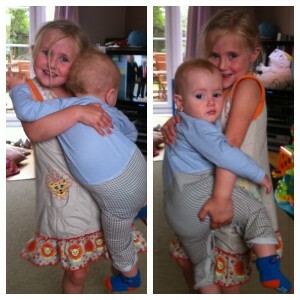 Of course, no matter how much Tilly loves her little brother, she loves your baby more. Eli after all is part of the furniture, your baby is like a new toy – unknown and probably smaller. I’m sorry. I am trying to teach her about personal space but it’s taking time. I know that when it’s your second, third, tenth baby you find it easier to relax in the face of her obsession with touching, cooing and toy rattling in your baby’s face (and tell her when to stop). When it’s your first I fully appreciate how big Tilly looks next to your tiny baby and how uncoordinated and dangerous she appears. I know she’s got a few years of growing before she’ll be trusted by you to cuddle her baby for more than a few seconds but I promise that she’ll have made sure that she has loads of practise by then. My daughter loves babies and yours is most definitely the cutest she’s seen. 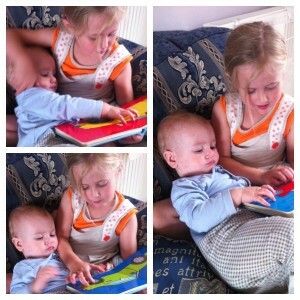 This entry was posted in Kids and tagged babies, tilly by twigletmac. Bookmark the permalink.